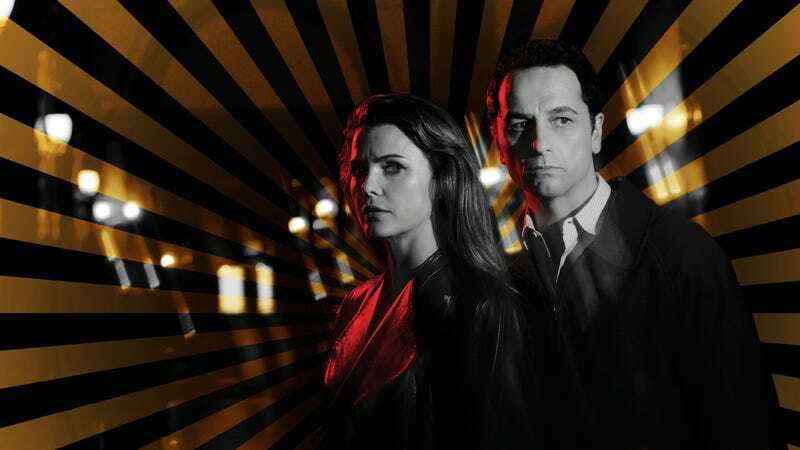 Keri Russell and Matthew Rhys play Philip and Elizabeth Jennings in The Americans. Photo: Pari Dukovic, Graphic: Rebecca Fassola. On a macro scale, the end was never in question for The Americans, FX’s patiently plotted thriller about Soviet sleeper agents in the waning years of the Cold War. But The Americans brought the suspense back to that long-concluded (though, as became apparent midway through the show’s run, not entirely extinguished) conflict because macro-scale wasn’t The Americans top priority. Communism was just a red herring, the spy stuff was an enticing Trojan horse, and the show became one of the best of this decade by blending Philip and Elizabeth Jennings’ missions to undermine the United States with an evolving portrayal of a marriage forged in fraud that developed into the real deal. Speaking to The A.V. Club from the editing bay where they were piecing together their show’s sixth and final season—which debuts Wednesday, March 28 at 10 p.m. Eastern time—showrunners Joe Weisberg and Joel Fields discussed endings, time jumps, and the fate of America’s most beloved postal automaton. The A.V. Club: How does it feel to be approaching the end? Joe Weisberg: It’s a big long exercise in bittersweet. If you think you’ve had bittersweet, this is really bittersweet. And it goes on day after day after day. It’s not all good, it’s not all bad. It’s a lot of sad, it’s a lot of love going on around here. It’s a very interesting and kind of emotional and soulful time. Everybody is feeling in their own different way. Joel Fields: The gratitude really does eclipse the loss. We’ve just been so lucky to be part of this adventure. So lucky to have this incredible team, these wonderful people to work with. AVC: When FX renewed the show for seasons five and six, how much had you thought about how the show was going to end, and how had that evolved? JW: It’s interesteing: Working season-to-season is great. You’ve got a whole season of television to figure out, and that’s a lot. And that’s what we were used to doing, and worked well for us. The actual ending of the show we figured out somewhere late in the first season or early in the second season. I think some of us were surprised that that ending has stuck. If we were gambling men, we’d probably would’ve bet that we would’ve come up with a different ending by now. But we really liked that ending, and it turned out it was the one we ended up using. As the show evolved, the characters evolved, plots and stories went in all different directions. The way everything ended up, [it] ended up sticking to that idea that we had very, very early on in the show. How we got there certainly took a lot of curves and a lot of turns that we did not anticipate—but the actual ending stayed the same. When we got the two-season renewal, I don’t think we even ourselves understood how helpful that was for plotting out the final run in these characters’ lives. It just gives you this expansive ability for your imagination. I don’t think we were even aware of it fully—the ability for the imagination to run free and plan a world for these people, and where they’re going, and what they’re going to do. And it allows everything to fall into place in a way that feels very organic. Very unconstrained and very open. AVC: Did you view those last two seasons as one whole? JF: I would say we simultaneously did and didn’t. Because, as you’ll see, there’s this big time jump between season five and season six, and they’re two very different stories, but they really are largely the some story. There’s no way we could’ve told the last 10 episodes without the prior 13. So that was enormously helpful, because there was a lot that was being launched, even though it’s going to be launched over a long time in the characters’ lives. AVC: How did writing this time jump compare to writing the one from season four? And how much are we going to learn about what happened in the interim? JW: Oddly enough, I thought this one was easier. Didn’t you, Joel? JW: Something about doing a time jump in the middle of the season presents a tremendous amount of challenges. We didn’t even do it between episodes—we did it in the middle of an episode! JF: We couldn’t have done it without David Copperfield. JW: This one was relatively easy. But it also provided us a tremendous ability to do what we wanted to do: One, show how the marriage had developed over these years, after Philip left his spying job—we wanted to have all the time passed to see what it had done to the relationship. And two, we wanted to jump forward to a time when history is taking all of these dramatic turns, so we’re in the midst of Glasnost and Perestroika—which is historical, but would have a real impact on Philip and Elizabeth. AVC: Is that the era you always had in mind for the ending? Is there any chance we’re going to see any further into the future? JF: We’ll let that one unfold over the course of the season. But we can say we’re here to tell Philip and Elizabeth Jennings’ story, not the story of the world or the U.S.S.R.
AVC: And what about fast-forwarding Paige’s story by a few years? JW: In terms of writing the character, we worked very hard even to change the cadence of her language. I remember we went through passes of just dialogue to try to account for those years of growth, because they’re such big ones for somebody of that age. And we worked hard adjusting her look: Changing her hair and changing her wardrobe. What was most important to us was capturing the changes in her personality and her relationship with her mother and father. And how much she had both individuated and connected to her mother as a young adult. AVC: Is Philip truly out of the business? JF: It’s not an easy job to quit. AVC: Is that what you were hoping to convey with the last act of this story? JF: I think in a way, it’s more about the marriage, and more about—you know, we were talking a little bit about the history and the changes in the Soviet Union, how those would impact Philip and Elizabeth, and just seeing it’s been a very complicated road for the two of them over the years of this series, with ups and downs and growing much closer. And now we’re seeing that, during this time jump, they’ve been driven further apart by him leaving the work. And now trying to see what are the effects on the marriage of that. And then the further impact of these changes in the Soviet Union. It always comes back to the same thing, which is the marriage and what’s the most that we can explore there. And this seemed like very, very fruitful territory. AVC: What do you hope the legacy of the show is? JW: We had a lot—and still have—of headier ideas about trying to explore what it means to have an enemy and why people create enemies for themselves. Those ideas mean a lot to us, but ultimately what we really tried to make was a show about a marriage and a show where people feel something and show that, even though most people are not undercover Soviet spies, a lot of people are married, and we wanted them to be able to relate to this couple, and even though this couple’s daily situations were a lot more extreme in certain ways, the things that they dealt with in those extreme situations were also the ordinary things in most marriages. AVC: Could you have predicted the renewed timeliness those extreme situations gained over the course of the series? JF: Quite the opposite. The reason Joe was drawn toward the 1980s and the reason that the allegory worked so well for the show was that when the show started to air, the idea of the Russians as the enemy was quaint, amusing, and a throwback. You were forced to think, “Wow, you’re right: There was a time when they were the enemy. Isn’t that weird? What is that about?” And then within a few years of the show going on the air, they were attacking our elections. AVC: Did it complicate the process of writing the show to have that distance disappear? JW: I don’t think so, because by the time it began to happen, we were very much in a walled-off world of the ’80s. And it was important for the dramatic integrity of the show that it stay locked in that world. Whatever was happening present day didn’t really matter, because it really had nothing to do with Philip and Elizabeth and Paige and Henry and Stan, and their lives. AVC: What’s the reaction you’re hoping people take away from the ending? JF: I don’t think we want to give a particular emotion, but our hope is there will be a lot of feelings. That there will be a lot of emotion. JW: We assume that all showrunners, at the finale of their series, are simply hoping not to get murdered. AVC: There are so many cautionary tales over the years. It’s a delicate process. JW: It’s a low bar, and a high bar: I want to not get killed. JF: Someone said they’re going to be very disappointed if it didn’t turn out that the whole show wasn’t one big, long prequel to Felicity. AVC: We will we get closure for Mail Robot? JW: There’s more than one Mail Robot appearance. We’ll tell you that.